Prior to 1840, the firm of Dunn & Stivens, a partnership of Samuel Dunn and Alexander Stivens, was making steam engines and machine tools on Ordsal Lane in Salford, England, near Manchester. In August of that year the firm was dissolved and their shop equipment was sold, including machinery for manufacturing double acting planing machines, slide lathes, key grooving and shaping machines, anvils, bellows, and vises. Samuel Dunn had earlier been the business parter of one John White, doing business as engineers in Salford under the name of John White & Co. That partnership was dissolved in September 1839. Either Dunn was active in two businesses at once or Dunn & Stiven was in business for less than a year. After Dunn & Stivens was dissolved, Stivens—who also used the surname "Stiven"—associated himself with John Mason of nearby Rochdale. The two men were co-inventors on an 1841 patent for a lathe chuck. A couple of years after that, Stiven, as he now called himself, was granted a solo 1843 patent for a bench vise of distinctive construction. 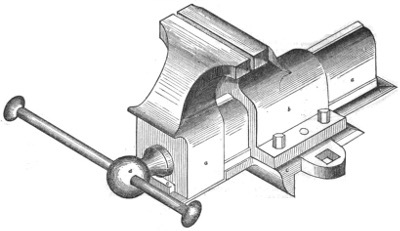 By 1845 Stivens was in New York City and was promoting his patent vise; by 1847 he had returned to the Manchester area and was jailed for insolvency. It seems that he paid off his debtors sufficiently to get out of jail and emigrate to New York where by 1848 he was manufacturing and selling his patent vise and perhaps other items. Meanwhile, Mason was making and selling the patent lathe chuck and bench vise for the British market. Information on these early makers is very spotty and we have not found any details on the machines made by Dunn & Stivens, nor can we determine whether the post-Dunn Stiven manufactured steam engines or machinery. 1839-09-10 The London Gazette: "Notice is hereby given, that the Partnership heretofore subsisting between us the undersigned, John White and Samuel Dunn, carrying on business as Engineers, in Salford, in the county of Lancaster, under the style or firm of John White and Company, was this day dissolved by mutual consent.—Dated this 7th day of September 1839. Ad in 1850-03-02 Scientific American : "A. STIVEN’S PATENT EPICYLOIDAL ROTARY PUMP-Alexander Stivens most respectfully invites the attention of shipowners and captains of ships, the proprietors of buildings, spirit dealers, and beer sellers, and the public generally, to his unequalled Rotary Pump. An examination is only necessary to satisfy any person of its utility. I can be seen at the workshop, 70 1-2 Bowery, in the rear, or at JOHN WHITAKER'S, Harmony Hall, No. 17 Centre street, where one is placed for public inspection. Patent rights for sale." Grace's Guide entry for Dunn & Stivens provided the information on the partnership, its dissolution, and the products made. It also allowed us to make the connection between "Alexander Stiven" (a vise maker we learned about via a tool archives.com entry) and "Alexander Stivens" of Dunn & Stivens. Grace's Guide entry for Alexander Stivens provided the information on jailing for unpaid debts. By 1853, John Mason was partnered with James Davenport and were making spinning and weaving machinery. They operated the the Globe Works in Rochdale. In 1862 Mason was exhibiting his spinning machinery at the London Exhibition.